I am a parent of a senior and can assure you I am feeling reflective this time of year! As I read through the list of events and accomplishments listed in this newsletter, I was reminded of how grateful I am that my children have been educated at Woodrow in this program and that our whole family has been a part of this community. My older son is wrapping up his formal education with preparations for exams and finishing papers and projects. I can see he is ready for the next step thanks to the work the teachers and Dr. Ritchie have put into his education. What a gift. I also look around and see the commitment of you all to support the teachers, provide and participate in community education, and advocate for student achievement and I am again in awe. 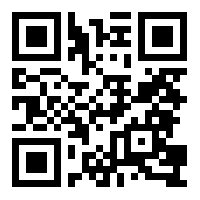 The time and resources you all share do make a difference for the IB program. We are in the final push to the end of a successful year and thank you for your service to this organization and the students who benefit from the program. Please consider roles where you can assist in our organization or in other groups at the school as everyone begins to plan for a successful 2019-20 school year at Woodrow! 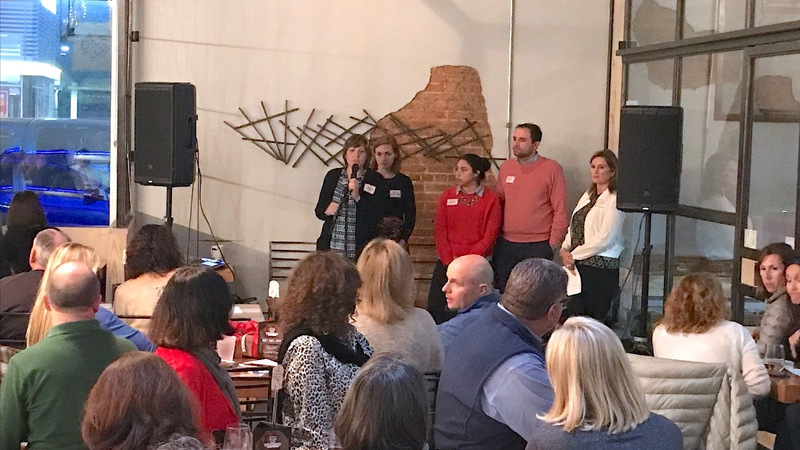 The IBPO Parent Social and Speaker Series was held at Toasted on February 27th. It was a full house and parents learned so much about what lies ahead for their students in their upcoming college searches. Thanks to our expert panel of guest speakers who led a very informative discussion about preparing for the college application process: Lesya Bazylewicz - Woodrow's Academic Success Program (ASP) College Advisor, Deidra Fisher - One Up College Consulting, Alex Munoz - SMU Office of Undergraduate Admissions, and Jackie Romero - SMU Office of Undergraduate Admissions. Many, many thanks go to Stacy Huebner and Jennifer Woods for coordinating another great event. We have recently concluded the admissions process for next year. There was a stellar group of 230 applicants and we anticipate that we will have one of the largest groups of incoming IB freshmen this fall. Our program continues to grow and we are so excited about all of the new families who will be joining us! The counselors have been finalizing the course selections for next school year. If you have any questions about your child’s course selections, please contact his or her counselor. We will start building the master schedule based on these selections. Next year Woodrow will move from a 7 period day to an 8 period block schedule. The class schedule will change from 7 classes which meet 50 minutes each day to an A/B block schedule where four classes will meet on A day for 90 minutes and 4 classes will meet on B day for 90 minutes. The administration is working on the bell schedule and that information will be communicated as soon as it is finalized. The Texas IB College Fair is coming up on April 16 at the Hurst Conference Center. We will be taking all of our IB juniors to the fair. A huge thank you to the parents who have volunteered to help chaperone! If you are available to go with us, please let me know. International Baccalaureate test scores at Woodrow Wilson surpassed the global average for the first time since the program was introduced five years ago, school officials said. 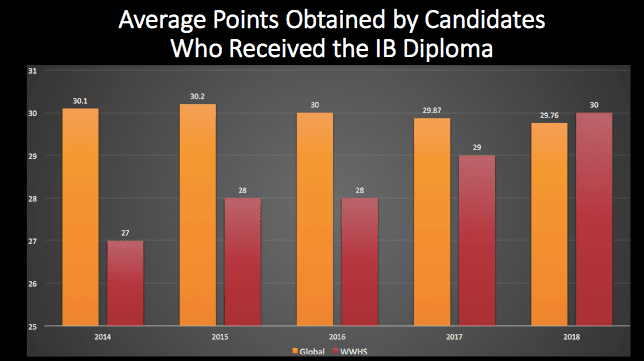 In 2018, Woodrow’s IB students received an average test score of 30, which is 0.24 percentage points higher than the global average, said Kelly Ritchie, director of Woodrow’s IB program. A perfect score is 45, and students must earn 24 points to earn their diploma. Woodrow’s first class of graduates scored an average of 27 in 2014. The school’s scores climbed steadily in subsequent years as the global average fell, according to test scores released in January. As test scores rose, the number of IB candidates at Woodrow increased during the same time. In 2019, more than 150 students, or about 8 percent of the student body, were enrolled in the program. The interdisciplinary, internationally recognized IB program provides students with college-prep curriculum. To receive their diploma, candidates must pass a series of essay tests, write a 4,000-word essay outside of class and complete community service hours. Graduates can then attend a Texas state college or university with 24 hours of earned credit. Private universities and out-of-state institutions also have their own earned-credit programs for IB graduates. It is hard to believe our 9th graders have almost completed their first year of high school, and so far, it has really flown by! The 9th graders have all worked on creating their schedules for next year, and should have brought home a draft for you to see and approve. It was a photo on their phones of the sheet they filled out with Dr. Ritchie and the counselors. Please ask them about it if you haven’t seen it yet. The schedules for next year are not going to be changing, so any concerns or questions you have need to be addressed ASAP. Also of note, we will be moving to a block schedule next year which allows for your child to take 8 classes instead of 7. Enjoy the spring with your, soon to be, raising sophomore! Our our sophomores have been in the final years of their Middle Years Program for IB, and have largely been taking on-level and Pre-IB (or Pre-AP) courses. 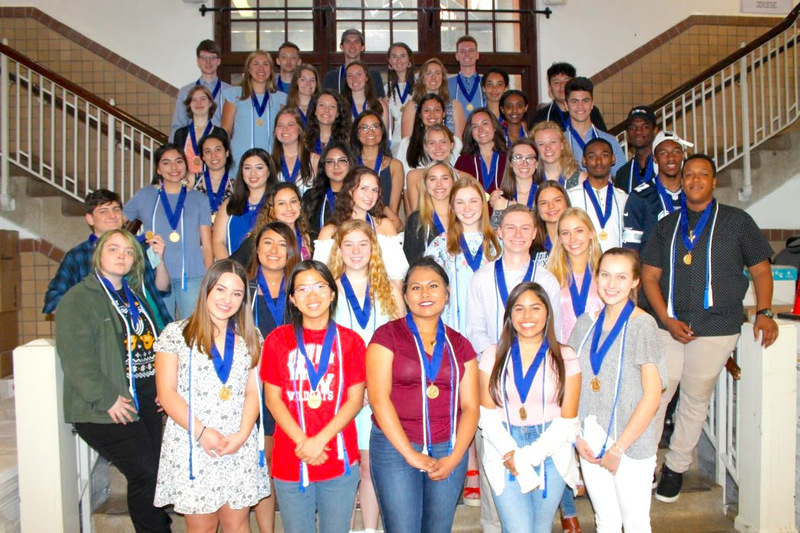 Next year, they will officially transition to the IB Diploma Program, taking IB Courses to earn an IB Diploma in addition to their High School Diploma. Award of the IB Diploma is based on successful completion of course-end exams, a 4,000-word essay and community service hours. Sounds like a lot? It is. That is why the IB Diploma is an globally-recognized achievement . Your student's pursuit of this diploma is a big deal to colleges and universities. It's also a big deal at Woodrow Wilson! The IBPO organized a Transition Celebration for our sophomores, providing lunch in the library while Dr. Ritchie discussed the Diploma Program and helped students choose IB courses for next year. After all, committing to a 16-page essay is easier with pizza! The class of 2020 has begun their journey through the EE in earnest! In January they trekked to the Dallas Public Library and the Fondren Library at SMU to learn how best to use these resources for their research papers. Last week they hit the first big milestone, turning in the rough draft for the introduction. They continue to meet with their advisors and push forward! The final rough draft for the EE is due at the end of April. Buckle your chin straps! The Juniors are knee-deep in IB now! The final months of high school are nearing for our IB Seniors as they prepare for Internal Assesments, final IB tests and GRADUATION! College acceptance letters have been coming in and our seniors are making that exciting decision of choosing where they will be next Fall. The IB Senior Send-off provided by IBPO Junior Class parents will be scheduled soon for late May. The date for this event has been in flux due to a later-than-usual IB testing schedule this year and we are working out which day and time will work best. We will still need volunteers to assist with this event so look for further requests to assist in honoring our hardworking seniors during the week of May 20th. Our IBPO knows this well and makes sure we never forget how loved we are. 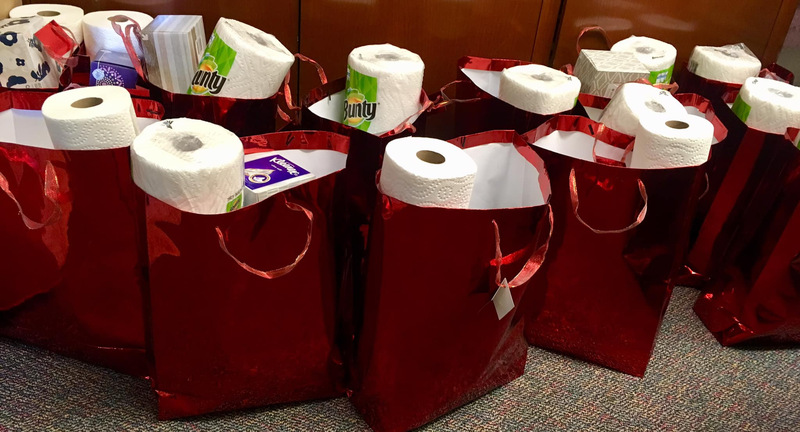 Our thoughtful parents provided Valentine bags that were completely filled with much needed mid-year supplies. To all who donated, thank you so much for these special gifts! And thank you for all the morale boosts that you provide all year long. SENIOR SEND OFF - We need volunteers to assist with this event which will honor our hardworking seniors during the week of May 20th. Please contact Carrie Fisketjon, our IBPO volunteer coordinator! All volunteers need to be approved through the Voly link on the IBPO website. We are in the process of slating next year's IBPO Board and Committees. If you are interested in serving on the board or a committee please let us know! Email wwibpo.news@gmail.com and tell us what you are interested in! Thanks for supporting Woodrow IB with your IBPO Membership! You are enhancing your child’s exceptional IB Education as an IBPO Member. IBPO bridges the gap from parent contributions to enrich Woodrow’s International Baccalaureate Diploma Program for our students and staff. Your IBPO funds are used to underwrite annual student events (freshman breakfast, sophomore DP luncheon, junior extended essay writing workshops, senior essay celebration, senior send-off), IB staff appreciation and needs, parent informational guest speaker series, freshman summer social and the IBPO website. Without generous contributions from our IBPO members, this program as it is would not be possible.